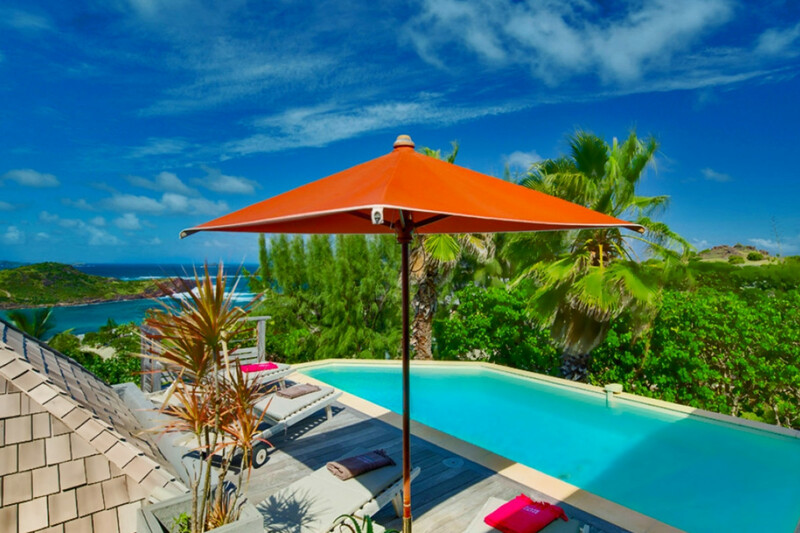 Villa Taurus, is a contemporary 5-bedroom villa located in Petit Cul de Sac within a short walk of the beach and minutes from shopping. This hillside villa enjoys beautiful views of the bay. This house has unique ceiling lights, which can be controlled to change colors. he 2 living rooms (one near entrance) both open to the terrace with view. A small breakfast bar separates the main living room from the well-equipped kitchen, which opens to a terrace and breakfast nook. The indoor dining area features ocean views, while the covered terrace houses an outdoor dining area with seating for up to 8 guests. The master bedroom is located off the kitchen and has a king-size bed (twin beds that cannot be separated), an en suite bathroom, and doors to a private terrace. The 2 bedrooms on the lower level have king-size beds (twin beds that cannot be separated), en suite bathrooms, and private terraces. The other 2 bedrooms are located in an independent cottage. Each bedroom has a queen-size bed with mosquito netting and an en suite bathroom with shower. This cottage also boasts a living area and kitchen. Loungers surround the large pool, which is adjacent to the living room. The house also has air-conditioning in the bedrooms, WiFi and high-speed Internet, a gas grill, beach accessories, and complimentary use of 2 kayaks and 2 paddleboards upon request. Guests also receive access to the Form Fitness gym and shared tennis courts. Villa Taurus comes with house cleaning services six days a week, except on holidays. During the December holidays, the villa rents at the full occupancy rate regardless of how many bedrooms are used. ###This villa is suitable for young children.